One of the top-rated beach cart today that you can consider buying is the Mac Sports beach wagon. 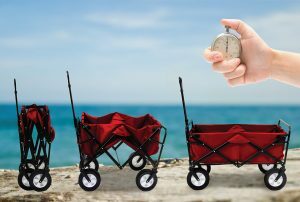 It is a collapsible folding wagon that many beach lovers would love to use. The product is convenient and comfortable to bring along to the beach. Frequent beachgoers would like the functionality of the product. This beach wagon is very durable that you can use it again and again without any difficulty. Durability is one feature that people are looking for in a product. 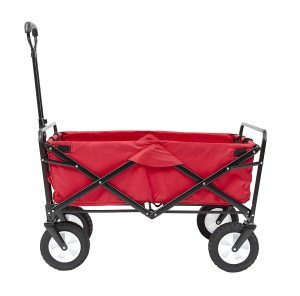 This wagon has been designed with a heavy-duty Denier Fabric, a material that is known to last longer. If handled carefully, you won’t be buying another one in the future. Another essential feature that consumers will be checking out is its weight load capacity. This cart has a high-quality frame that can hold up to 150 lbs. That is doubtlessly more than enough for your beach cart. This wagon is three feet long and two feet wide and deep when folded. The handles are adjustable, and it is easy for you to drag it over the sand. It includes adjustable handle for easy transport and two mesh upholders. It is available in eight colors and styles. This beach gear can be a good option for outdoor sporting events to carrying stuff, trips to park or beach and others. If you fold the wagon, it is only 8” thick. The Mac Sports Beach Wagon is the best way to carry your beach accessories from your vehicle to the sandy beach mainly if it is a long distance to walk. The cart has unique designs suitable for smooth movement on the sand. But, before you buy one always think of the type of beach cart you will be pulling around with you. Choose the one that has enough space to bring all the equipment you intend to take with you. The wheels are one feature that people will check before buying. You don’t want to end up frustrated with the cart you purchased and wish you should have carried the stuff instead. 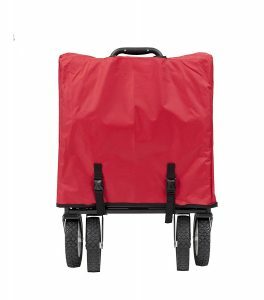 The Mac Sports Beach cart is convenient since you can fold it away for easy transport and storage.